Place the banana and mango in an airtight container and freeze for 4 hours or until frozen. 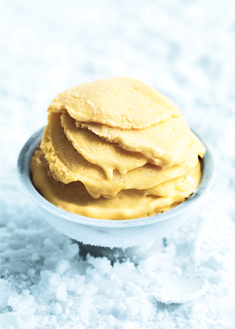 Place the banana, mango and yoghurt in a food processor and process until smooth. Serves 6–8. Tip: If not serving straight away, return to an airtight container and freeze. Allow to soften for 5 minutes before serving. You could scoop into ice-cream cones to serve.